Felipe Calderon congratulated President Obama on his bold move to reduce carbon emissions in the United States. Maria van der Hoeven, Eduardo Paes, and Caio Koch-Weser have joined the Global Commission on the Economy and Climate. Mr. Trevor Manuel, the former Honourable Minister in the South African Presidency, was a panelist at a high-level session at the African Development Bank Group Annual Meeting. In April and May, individuals involved with the New Climate Economy project appeared in multiple news sources. At Abu Dhabi Ascent, a high-level meeting hosted by the United Arab Emirates to generate momentum for the Climate Summit at the UN, Felipe Calderon urged participants to pursue economic action on climate change. The New Climate Economy's mid-April update on its appearances in the media. The New Climate Economy project launched in Ethiopia on March 6th, some of the largest media outlets in the country covered the event, including Addis Fortune and The Reporter. 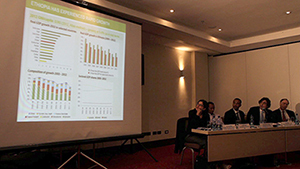 The New Climate Economy project launched in Ethiopia on Thursday the 6th of March. Minister for the Environment Ato Belete Tefere and United Kingdom Ambassador to Ethiopia Greg Dorey were joined by New Climate Economy Programme Director Jeremy Oppenheim. The New Climate Economy (NCE) project has launched a call for evidence on cities, technological innovation, and agriculture, forests, and other land use. This is part of our effort to assemble the best available research and knowledge on efforts that can increase economic growth and minimise climate risk.